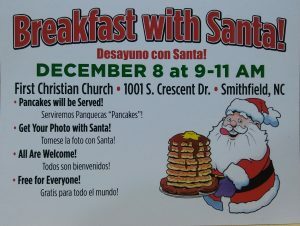 Join us for our 4th annual Breakfast with Santa to be held Saturday , December, 8th from 9am til 11am in the First Christian Church Fellowship Hall.Free Pancakes will be served plus children can get their photo taken for free with Santa and each child will receive a gold coin to go shopping for a free gift for mom or dad at our childrens store. Free for everyone! Free for everyone! *Our Church is located beside South Smithfield Elementary School. Hope you’ll join us on December 8th.